Or maybe it’s nothing important at all. Maybe it’s just because I’m so damn picky. Pearl, my birthstone, when round, white, and smooth is too buttoned-up, too, well, someone else, despite my admiration for Audrey Hepburn. Girl’s best friend, no matter how large and faceted, lacks complexity (unless it’s an engagement ring, of course). It’s all shine, no substance. I would be happier with a gem-less bangle with an interesting design or a (purposely) misshapen, matte stone hanging off a chain. I used to prefer silver, finding gold gaudy; now I prefer gold, finding that the tawny yellow better complements my skin tone. But there’s one gemstone, citrine, that always catches my eye when I see it in a case or on the glossy page of a magazine. It’s not particularly rare or expensive. It’s not at the top of every other girl’s wishlist. But there’s something about it that perks me up — its burnt-orange, depths-of-autumn color sharpens the vision of my always-hazy eyes when it catches the light. Yet I don’t own a single piece of jewelry that showcases this stone. I can’t find a setting worthy of its beauty — demure enough to let it pop. I came close. I found a thin band of gold with a large round of citrine in the center (larger than anything I’ve ever worn) and a simple, but intricately etched border around the jewel. I ordered it, slipped it onto the fourth finger of my right hand and admired it. I could almost feel the warmth radiating from the reflecting light on my chin as I turned my finger every which way. And then the light shut off as the ring slowly slipped, the jewel landing on the backside of my palm. I’d size it down. No can do: The band was so wire-thin (the reason I liked it) that sizing was dicey. I forgot. But I roasted clementines for the first time this past weekend. I reached for them only because I wanted to play, but it was snowy and I had little on hand. Sometimes, I have found, these moments result in the most delicious of dishes, like these crêpes with roasted clementines. I can’t say the citrine inspired the dish — there was not much of a creative process to speak of — but I can say that by the time the tiny segments were drizzled with honey, dotted with butter, splashed with clementine juice, and left to roast until the syrup reduced and caramelized and the fruit wrinkled just slightly, I couldn’t help but liken the finished bowl of sunshine to that faceted stone of citrine. And the clementines gave me that same feeling. So maybe it’s not the gem itself — maybe it’s just vibrant orange color that inspires me, whether a gem, a piece of fruit, or a summertime sunset. Maybe it’s the brightness it adds to a wardrobe or a day or a sky of gray. But what the gem doesn’t have is that juicy pop of honey-roasted sweetness that these clementines have — so fresh they taste like they’ve been roasted by the warm sun, not the heat of the oven. I was craving the rustic nuttiness of traditional buckwheat crêpes, but I didn’t have any buckwheat on hand. What about a spelt crêpe? I figured it would have a sweeter nuttiness with a slightly lighter texture (boy, do I love spelt flour). Topped with my clementines and a vanilla bean–flecked crème anglaise, they were soul satisfying. 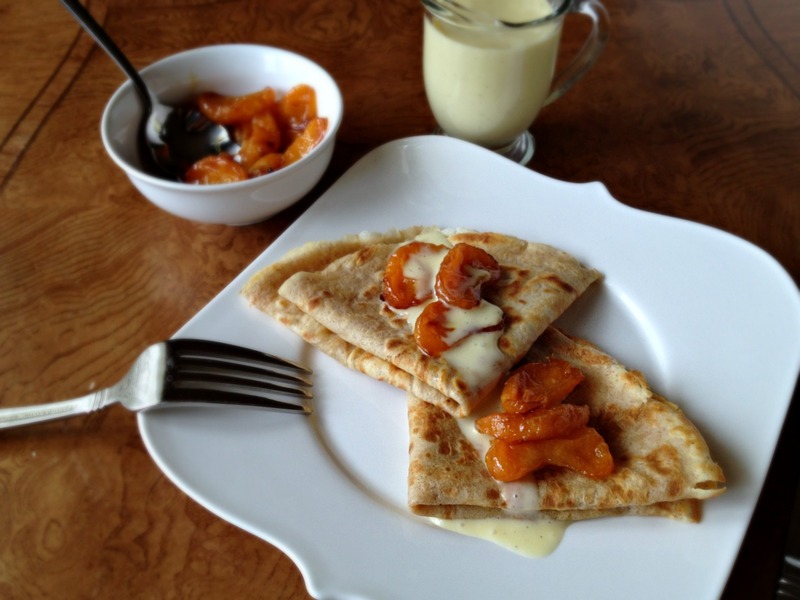 The colors were brilliant and the flavors complementary; the honeyed clementines brightened the warm nuttiness of the rustic but still-delicate and custardy crêpes, and the drizzle of chilled crème anglaise brought some richness. I’m still looking for a piece of citrine jewelry — preferably a ring. And I still don’t really know why. What kind of fulfillment can I get from a gem? Do I really think a stone can bring inexplicable warmth? I’m not sure, but when I find it, I’ll let you know. For now, I’ll enjoy the color and warmth of what’s on my plate, not my finger. This makes a small yield by design — it’s more romantic that way — but it can easily be doubled. I made the crêpe batter in the canister of an immersion blender, but you can also process it in a traditional blender. I used whole grain spelt flour here; it will not make the crêpes heavy or gummy like some other whole grain flours can and carries a rich nutty flavor. You can substitute white spelt flour for a milder nuttiness. Do not substitute all-purpose flour here. You can use any percentage of milk you like in this recipe (I used 1%). You can make the components of this recipe in whatever order you find efficient; however, the clementines are best when fresh from the oven (though they can be reheated if necessary). 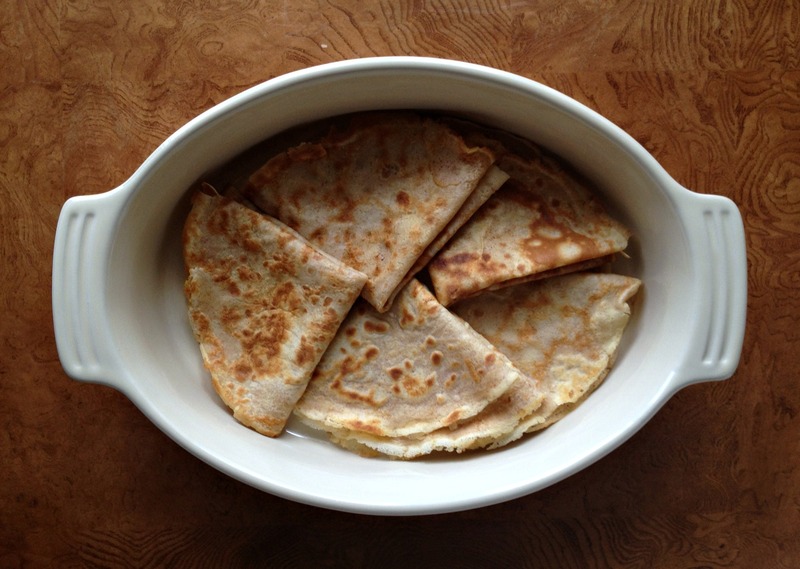 To reheat crepes, fold them up and place them in a 325-degree oven until warm, 10 to 20 minutes. Scrape out seeds from vanilla bean. Combine bean, seeds, cream, sugar, and salt in small saucepan and heat medium heat until until warm but not bubbling (around 165 degrees F). Remove pan from heat, cover, and let infuse for 30 minutes to 1 hour. In medium bowl, whisk egg yolks. Rewarm cream mixture and drizzle 1/3 mixture into egg yolks, whisking constantly. Slowly drizzle remaining mixture into yolk mixture in steady stream, whisking constantly. Transfer mixture back into saucepan and cook, whisking constantly, until custard is thickened and registers 175 degrees (due to the small yield, this will occur quickly). Strain custard through fine-mesh strainer into bowl and whisk over ice bath until barely warm to touch. Transfer to refrigerator to chill. Adjust oven rack to middle position and heat oven to 375 degrees. Separate segments of 2 clementines and place in small baking dish. Dot with butter, drizzle with honey, and sprinkle with salt. Squeeze juice of remaining clementine over segments. 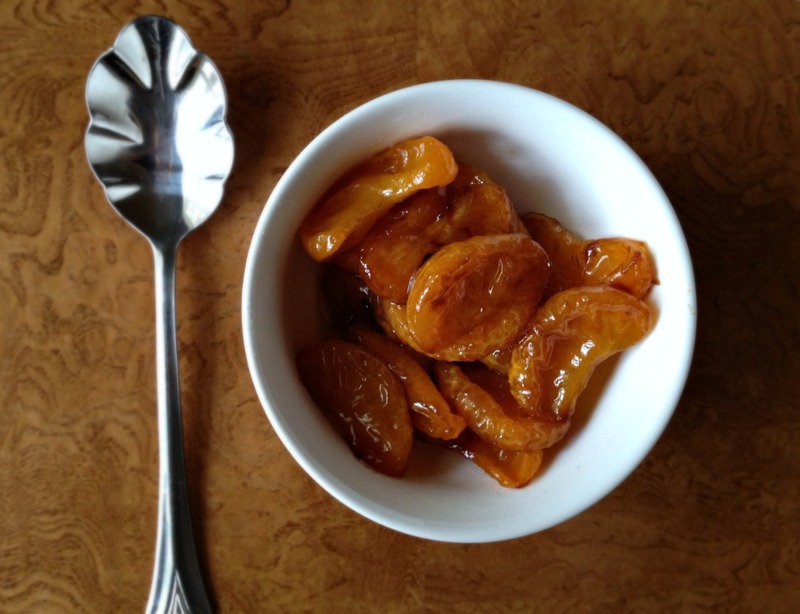 Roast until clementines are slightly wrinkled but still plump and syrup has reduced and caramelized on the fruit, about 30 minutes, tossing twice during cooking. Fold warm crêpes in half and in half again. 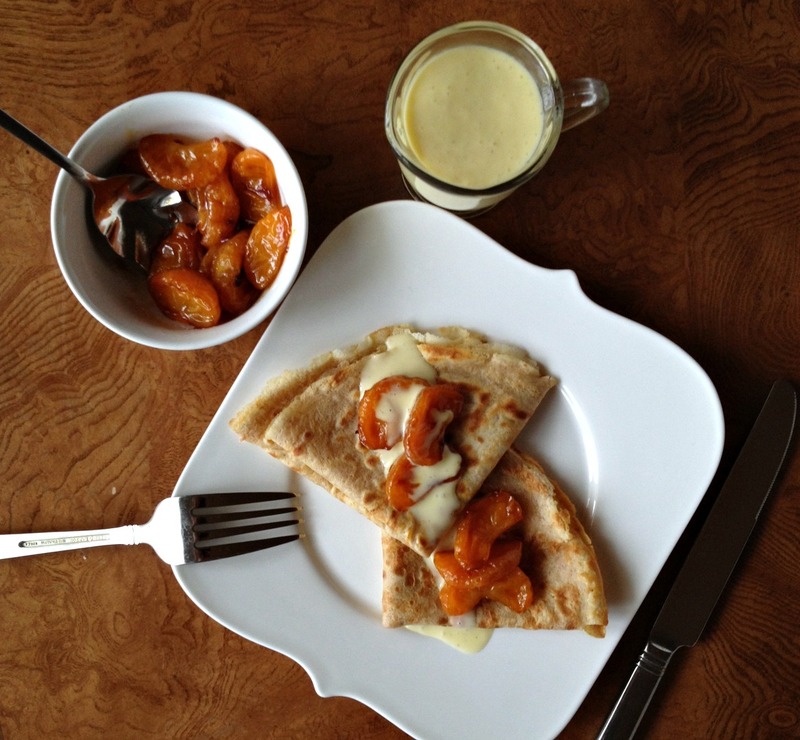 Spoon warm clementines and some accumulated syrup over crêpes, pour on chilled crème anglaise, and serve immediately. I’m not a huge jewellery-wearer either – I prefer to spend my money on food! Better to have a couple of pieces that mean a lot to you than loads of things you never wear and don’t care about. I always seem to stop eating clementines after Christmas – not any more now I’ve got this recipe on hand! That vibrant orange color is so welcome right now, with all this gray dreary weather we’ve been having. I filled a basket at Whole Foods with citrus last night, from kumquats to tangerines to Cara Cara oranges to blood oranges and made a tangerine sorbet last night. I get it.